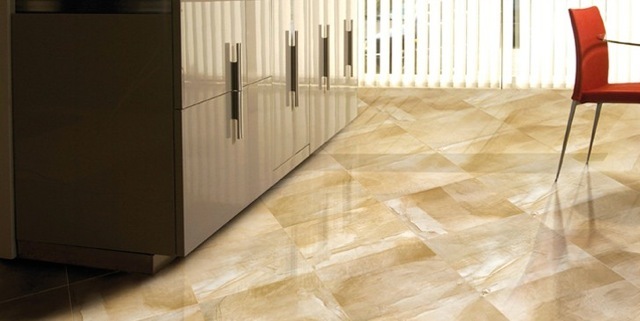 Extraorindary tile and stone for your home. “Calming and soothing… Stunning… Like nothing I’ve ever seen before…” Clients are telling me how they want to feel when they walk into a room. The overall trend is to a much more personal and sophisticated sense of style and function, and – as a tile designer – I’m absolutely having more fun. This is, by far, the hottest look. Glass can infuse a classic or contemporary interior with light and color. When you walk into a room that has iridescent glass tile, floor to ceiling and wall to wall, you will feel as if you just stepped into a magical grotto. Or, simply tiling a fireplace surround and hearth in a stunning glass texture or mosaic pattern will create an unforgettable focal point. 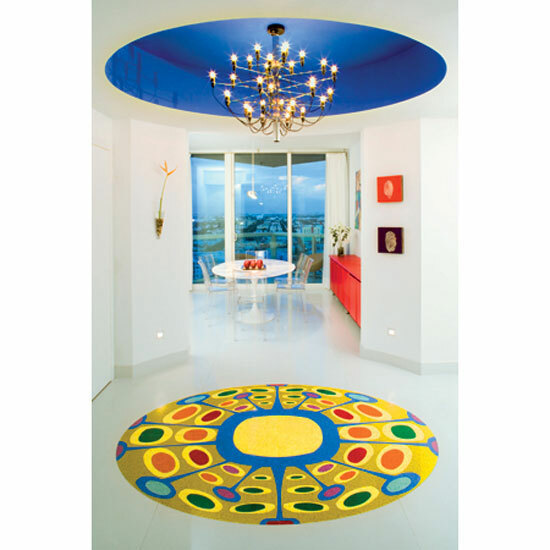 Tabletops can be custom designed to pick up the colors of your rooms. And, for clients who need that extra, over-the-top bling, we design custom, glass-tiled valances. There is so much glass in my showroom that I can only begin to describe the options. There is an unprecedented demand for highly unusual granites, marbles, stones, and tiles. Clients want unique materials that elevate the look and feel of their homes, and we don’t hesitate to use rare natural stones, handmade ceramic tiles and trims, and custom made tiles in their home designs. I am constantly adding new lines of tile and stone that are difficult to source, such as handmade glass, leather, and metal tiles, to keep ahead of the curve. You are not alone. Everyone seems to want tranquil rooms that soothe the senses. From an elegant, spa-like retreat in a master bathroom, to casual and child-friendly family rooms, people are choosing the calming palettes of sand, sea and sky, mixing natural stone, ceramic tile and all manner of glass tiles in beachy and luminous colors. Today’s larger rooms need larger-scale floor tile. We are installing 12” x 24” and 24” x 36” for a grand effect, particularly where a beautiful marble or antique limestone is selected. With bathrooms becoming larger, we are incorporating nooks for television and sound systems in the tile design. Often, a carved stone or tiled fireplace competes with an enormous tub (complete with its marble tub surround, of course) for the center of attention. People bring me things that make them happy, or hold their best memories. Decorations are only good if they’re personal – a child’s favorite shell collection, a photograph of their boat, or the quilt that Grandma made. I love to use tile to layer what people love into their surroundings. 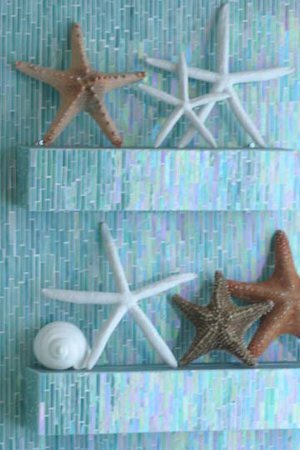 I can build a tub surround with seashell-patterned tiles, have a photographic image glazed into a custom tile backsplash, or use Grandma’s quilt pattern to make a tile “rug” or wall decoration. 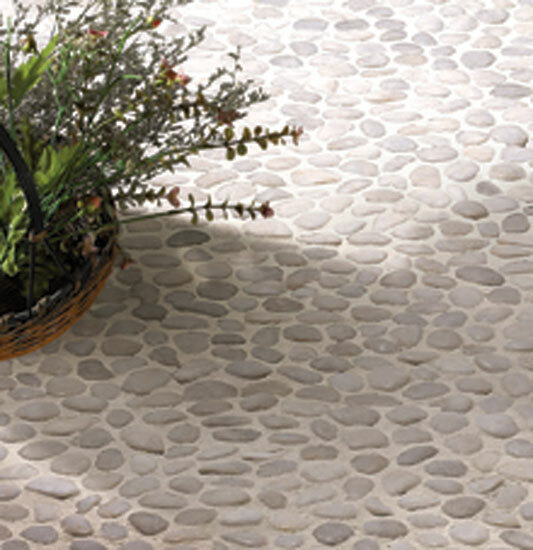 The natural look of river rock and pebble stone is very trendy. It’s great for floors, including shower floors, and comes in a variety of natural colors and textures. I recently combined a deep, blue-grey river rock on a customer’s floors with a lighter grey polished slate on other surfaces, for a stunning natural look. 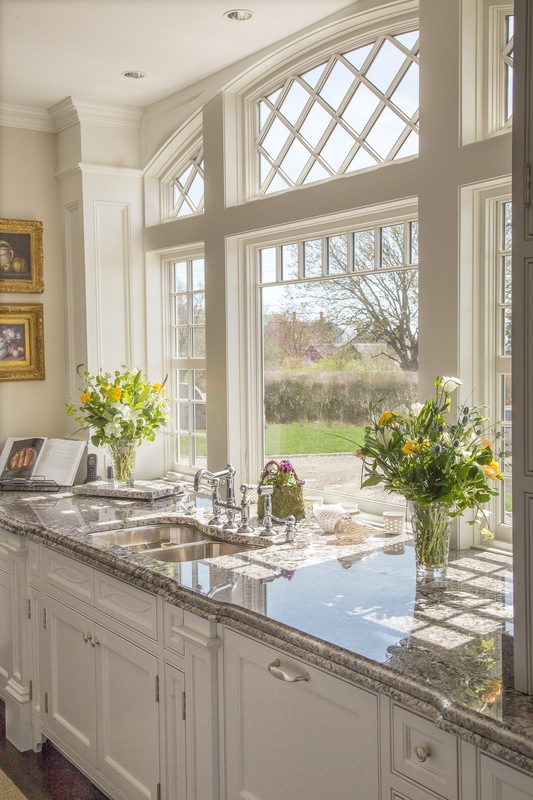 Thick stone countertops with elaborate edge patterns make an undeniably grand statement. We are using 2” – 3” thick or thicker slabs of beautiful countertop materials, such as Carrara and Calcutta marbles or gold limestone, with unique edge treatments that combine ogee, crown, or other patterns to reflect and emphasize the architectural elements of a space. Choose Texture for Subtle Impact. People have always loved subway tiles laid in horizontal, vertical, or herringbone patterns. 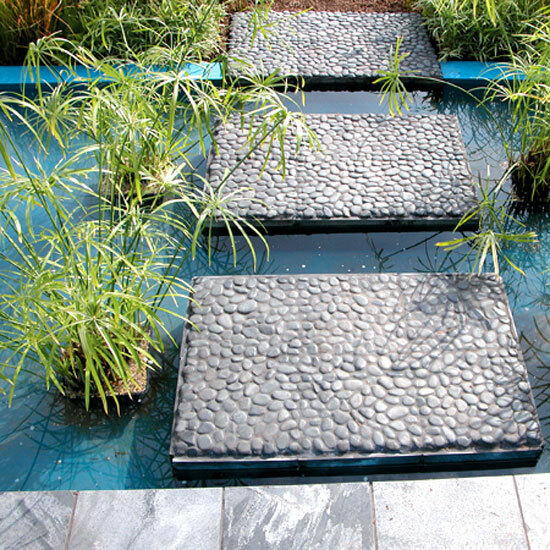 Now, imagine mini or micro subway tiles – in glass, perhaps – and the intriguing textural effects that can be achieved. 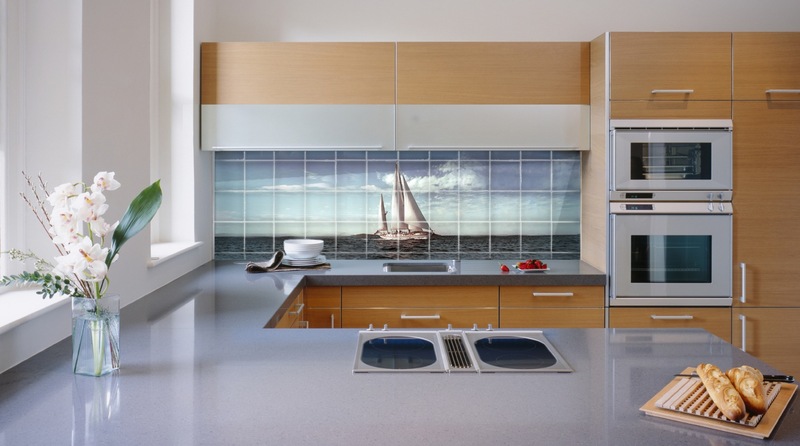 The new “baby” subway tiles come in ceramic as well as glass, in a vast color range, and in any size. New textural looks for marble include 2” X 4” and 3” X 6” tile with beveled edges, laid in a vertical or horizontal pattern. I also love to mix textures, such as ceramic or tumbled marble tile with beach glass. 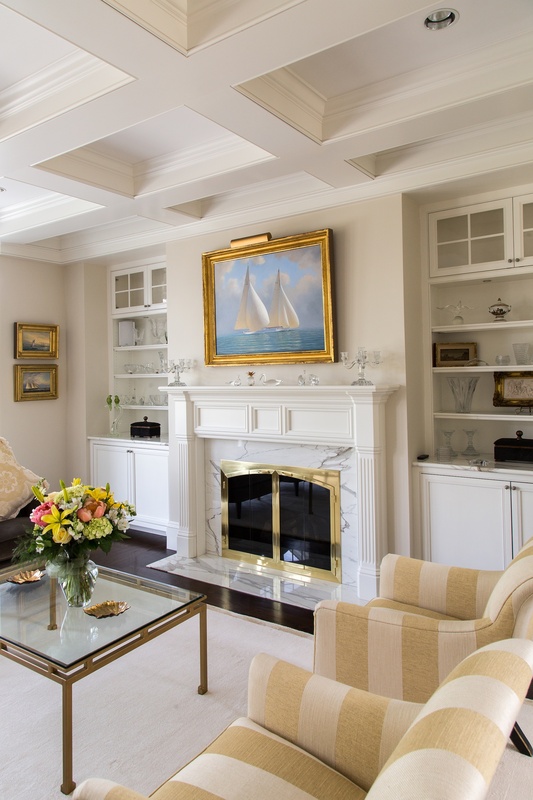 People want to use materials and styles that make new houses look as if they have been in the family for generations. For an old world look, I like limestone in 16” X 24” tiles with hand-chiseled edges. Architects are also very interested in combining 6” X 12” marble and limestone tiles with matching smaller tiles, yielding another luxurious, classic look. Classic, timeless looks can also be exciting. Try marble and glass together in a bathroom. Or, for a “wow” kitchen, use Emerald Isle granite for countertops – it’s a rare green iridescent stone with dark green, black, and cobalt blue flecks. Mix it with iridescent blue-green glass, and enjoy the room’s elegance and beauty every time you use it. More and more master bathrooms are being done in stunning combinations of over-the-top materials. For example, I’ve combined glass walls with pebble floors and precious onyx or marble vanity tops and tub decks. Whatever is gorgeous, personal, and beautifully created will always be, for you, the best and most lasting trend. 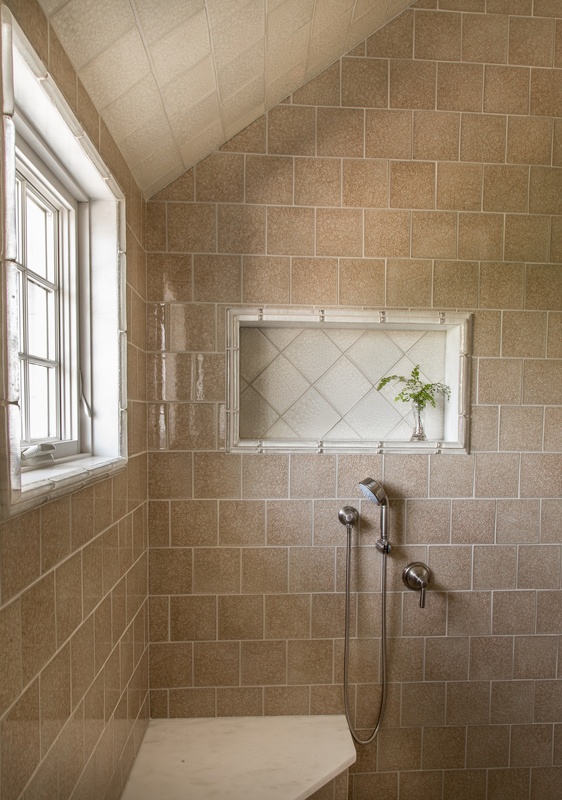 Weatherly Tile & Stone offers a depth of resources that is unrivaled in New England. Recent showroom expansions have incorporated many exclusive new lines of specialty tile, including handmade glass tile and custom 36” X 40” hand cut tile, as well as rare granites and marbles. Owner Gaye Weatherly now offers custom fabrication in her private facility. Her emphasis on customer service, including availability for site visits, have earned the loyal business of leading architects, designers, and selected builders. 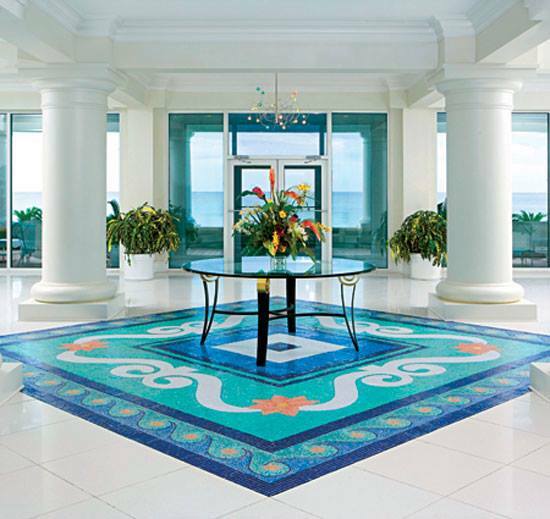 Weatherly’s custom tile and stone designs can be found worldwide. Local projects include the Newport-area mansions named Grey Craig Estate, Bridal Path, Quail Tree House, as well as private residences at Carnegie Abbey and numerous special properties in Jamestown, Block Island, and the Vineyard. Other notable projects include a residence in Trump Tower, a very special pied-a-terre in Boston, a hotel in the Caribbean, homes in Hilton Head and Bermuda, and custom yachts in Florida and the Mediterranean. The Weatherly Tile and Stone, Inc., showroom is located at 3030 East Main Road, Portsmouth, RI. Phone 401-683-5577 for information.